Dr. Henry Chusuey, chairman of the Henann Group of Resorts, exhorted the tourism industry stakeholders in Panglao to steer clear from a similar devastation that is now engulfing the island paradise of Boracay. Speaking before members of the Panglao Island Chamber of Commerce (PICC) during their meeting at the Henann Resort Alona Beach in Panglao, Chusuey painted a gloomy picture of Boracay as not only grappling with an environmental catastrophe but also mired in corruption involving national agencies and the Local Government Unit (LGU). Asked by the Chronicle if Panglao has reached the level of corruption of the LGU of Malay, Aklan where Boracay is located, Chusuey politely declined to comment. 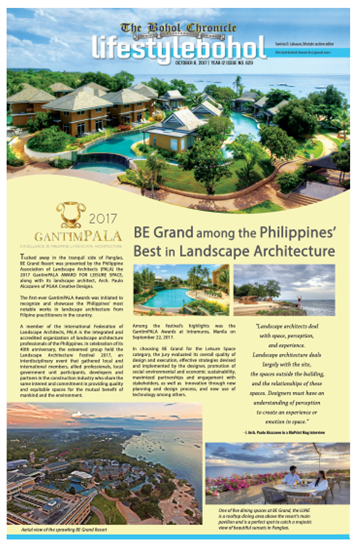 Rommel Gonzales, PICC President and General Manager of Bellevue Resort Bohol forewarned the members that “Panglao is the next target of the DENR”. President Rodrigo Duterte’s order to strictly implement environmental laws is “equally applicable to all tourist destinations including Panglao, according to Presidential spokesperson Harry Roque, Jr. who was a recent visitor to Bohol. With the completion of the PhP7.8 billion New Bohol International Airport in September this year. Alona Beach, the tourist hub in Panglao is now the center of a joint effort between government and the private sector led by the PICC to stave off a looming ecological catastrophe that threatens to inflict negative consequences on the booming tourist industry. Disastrous consequences of the unabated construction of beachfront structures in clear violation of local ordinances and national laws on easements and the National Building Code is now rearing its ugly head with stakeholders alarmed by recent developments besetting the once pristine destination. Several establishments were served notices of violations by the Department of Environment and Natural Resources (DENR) and the Environmental Management Bureau (EMB) for non-compliance with environmental laws. Duterte, during a recent speaking engagement in Cebu City, accused local officials and the DENR of “serious neglect of duty” for creating a cesspool of the country’s top tourist destination while lambasting the LGU for approving the construction of commercial establishments without proper sewerage. Gonzales invited Chusuey to share is experiences in Boracay considering that, as a long time resident of the island, the environmental woes that have fallen the island paradise can be avoided in Panglao. Chusuey traced Boracay’s environmental woes to the unbridled discharge of sewage through the drainage pipes into the seawaters of the island and the mushrooming of illegal structures within the delineated salvage zone. Panglao, at this stage, should strictly monitor all phases of its development and urged the PICC to engage LGU officials to “do their job”, according to Chusuey. According to Chusuey, stakeholders should push the government for the establishment of a central sewage treatment plant with all establishments connected to minimize expenses, especially for small establishments. Garbage fee, which the hotelier considered very low, should be increased to attain efficiency in the collection of garbage. The demolition of retaining walls built along the beach establishments should be a priority considering its negative effect on the volume of sand along the seashore, suggested Chusuey. But several stakeholders expressed opposition to the destruction of the sea walls considering the topography of the seashore which is sloping and in most parts is uneven. Chusuey also touched on the pressure exerted by the government for resort owners to report the correct number of guests staying in their establishments. The requirement by the government to report the accurate number of guests for statistical purposes will not succeed because it is too much of a risk for businessmen to be assessed with a higher tax, Chusuey candidly told the PICC. If the government needs an accurate data on the arrival of tourists in Bohol, data gathering should be done at the ports of entry similar to Boracay which reported an estimated tourism revenue of P43.9 billion last year. During an exclusive interview with the Chronicle, Chusuey welcomed the proposal of PICC vice president and former Panglao Mayor Dr. Doloreich Dumaluan for Panglao to seriously consider the setting-up of an independent power plant to address a crippling power shortage during power interruptions from Leyte, the province major power source. “With a power plant in Panglao, the financial strain of setting up our own generator sets and its maintenance will be significantly reduced,” Chusuey said. Admitting that “I am the least violator” in Boracay, the owner of the biggest resort in Bohol with 400 world class rooms located in a 6.5-hectare property along the coast of Alona Beach in Barangay Danao expressed confidence that stakeholders led by the PICC would avoid the pitfalls now plaguing Boracay while exerting pressure on the LGU to implement the law and local ordinances.